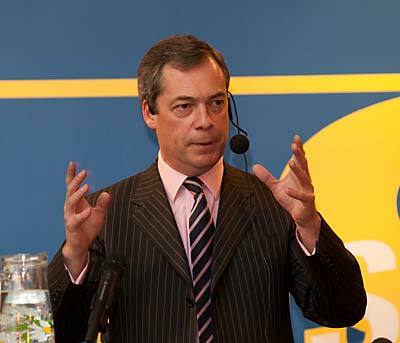 EFD-ryhmän puheenjohtaja Nigel Farage kesto 25:20 min. 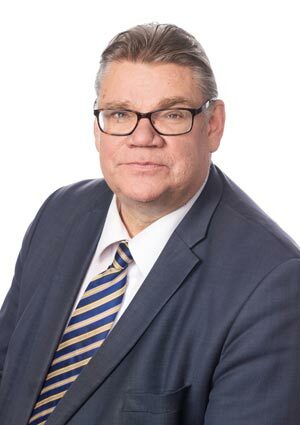 I would like to thank you very much for coming here tonight, and I would especially thank your MEP Timo Soini, a great personal friend and a politician for whom I have the utmost respect. Timo does a great job fighting for the interests of the Finnish people in the European Parliament and our Europe of Freedom and Democracy Group are privileged to have him as Chairman of the Bureau. His honesty, political judgement and humour are something that we all deeply appreciate. He has shown his great sense of humour in a stunning fashion by inviting the Group here in the wintry depths of February! I am a great fishing fan, but you shall excuse me for passing up on the offer to doing a bit of ice-fishing here this week. I prefer the fish frozen after they have been caught rather than before. The members of our Group who came to attend the Annual Conference of the True Finn Party in August have told me Finland is a very beautiful country and they received great hospitality from the people. Finland: a country with a proud struggle for Freedom. Reading about the history of Finland, I have learned that the Finnish people struggled for many centuries in order to win your freedom and independence, first from Sweden, then Russia. In the 20th Century you had to fight against both the Soviet Union and then Nazi Germany. Your forebears worked and fought long and hard to be able to democratically determine their own future. Your Declaration of Independence from Russia in 1917 and consequent formation of Finland as a nation state were crucial events in your progress towards democracy. Democracy of course cannot exist without the consent of a demos ( a people with a shared language, history or culture). A demos necessitates at bare minimum a shared consciousness – a sense of ’we’, a group with an identity and sense of belonging together. The people of Finland certainly have that. One important litmus test for a demos, is that the people of this demos share a sense of solidarity so that they are willing to help pay taxes and fund other members of the same demos of a different area with lack of financial means. Ask yourself; are the taxpayers of Finland willing to fund the payment of civil servants in Athens, the wages of social workers in Sicily and the construction of motorways in Latvia? The EU is a danger to Finnish Democracy. Are the citizens of Finland happy that through the institutions of the EU, Commissioners from Bucharest, Budapest, and Bratislava are able to dictate the laws that are enacted through the EU for the people of Finland? I think not. Membership of the EU means that laws can be made in Brussels by people you cannot elect or get rid of and are imposed upon you against your will. If Finland is like the other countries in Europe, it means that a high percentage of the laws which pass through your national parliament each year originate not in Helsinki but in Brussels. However, I am here tonight to warn you of the danger that the European Union poses to democracy in Finland. Your democratic will as a sovereign people can be overturned and ignored time and time again because the EU has a different agenda. The EU is not just undemocratic but anti-democratic. I put it to you that the EU is not just undemocratic but anti-democratic. But no, they continued as before, they rebranded it, they kept its contents but changed its name to the Lisbon Treaty. It of course contains the transfer of the exact same powers away from the nation states as the EU Constitution. The Irish people, the only people to get a vote in a referendum, then said no to this Lisbon Treaty. Timo and I both went there to campaign for a No vote in Ireland during September 2009. It was an incredible time, because never have so many people been lied to by so few. The ’Vote Yes for Jobs, Yes for Recovery’ slogans of the Yes side have been exposed as a complete lie. The bias of the national media, and closing of the ranks by the political establishment was simply breathtaking. The EU political elite who poured millions into the Yes campaign in Ireland delighted in shameful, undemocratic, bullying behaviour. The Irish people were threatened with isolation and poverty, and they took the lie. What this exercise showed was that what the political elites are actually creating in the EU is not a Federal Europe – but unitary centralised government. Something increasingly reminiscent of what fell to pieces in the old Soviet Block a few decades ago. It is revealing that many of the apparatchiks and even Commissars from the Soviet Block have turned up in Brussels and found themselves influential positions within the EU institutions. Commissioner Kallas is a fine case in point. The centralised planning and management of all state affairs was a mark of the old Soviet Union. The EU project – the centralised management of a continent as diverse as Europe has also proved to be a total failure. You will notice the areas in which in the EU has most control have been the greatest disasters. The Common fisheries policy of the EU is both an economic and ecological disaster. When fishermen have no sense of ownership and responsibility for the waters that they fish, they simply turn to plundering the Common EU fishing area as best they can. The result is a quota system which forces fishermen to throw perfectly good fish back into the sea-dead and has reduced to an alarming extent the fish stocks of our oceans. Another prime example of the ‘One size fits all’ policy of the EU is that currency disaster called the Euro. From its very beginning, the Euro was a bad economic idea, designed as a means of forging political union. It was a single currency in search of a state. The ECB sets interest rates in the main for the benefit of bigger economies such as Germany and France. In the first years of this decade, both these economies were sluggish so Euro interest rates were kept low – leading to Europe being awash in a sea of cheap credit. This lead to a splurge in spending, meaning more debt and a building boom which led to an inevitable bust in countries like Ireland and Spain. Both these countries today have high rates of unemployment and no means of stimulating economic growth. Due to membership of the Euro currency, the people of Finland were forced to bailout countries such as Greece. The current situation is that the EU plays, Finland pays. The Finnish people should rightfully oppose forking out a huge amount of money to prop up a failed currency. We have to face some basic economic facts here: The strong economies of northern Europe and the weak economies of the Med are incompatible. You can’t hold two watermelons in the same hand at once. It is a huge waste of money trying to bail them out. Yet why should the Finns pay millions of Euro to bail out Club Med, and prop up the Euro, while being forced to cut their budget for social spending? The euro currency and political union is a crazy project. The Euro is a folly which no longer serves the interests of the Finnish people or indeed the other peoples of Europe. It is in everybody’s interest that countries like Greece, Spain and Ireland leave the euro, take up their own currency again and devalue. They need to be free to prosper. The alternative for these countries is a deflationary spiral, allied to increasing debt levels and eventual default. The people of Greece and Ireland are caught inside an economic prison, locked up inside an economic Volkerkerker. It tells you everything you need to know about the political class who cheer lead the EU that they are willing to see millions of people trapped in poverty and despair in order to see their euro dream come true. If one good thing comes of these events, this economic crisis in Europe, facilitated in many ways by the Euro, will finally make people question this whole project of political union. The Euro is unwanted just as political union is unnecessary. According to the EU Barometer poll carried out before Christmas, it is becoming evident that the EU project of ever closer political union is becoming more and more unpopular. Even countries like Portugal and Germany, where Euroscepticism was never strong before, have started to wake up and realise that their democratic and economic powers have been stolen away from them. All across Europe the people are turning against this EU project. Yet at the same time the political class support it. This is why it is crucial that Finnish citizens support Timo and the True Finns Party in their drive to restore national democracy and economic sanity to Finland. In response to the fall in popularity of the EU, its political masters could of course ask the people who are unhappy about its direction how they want to turn. But once again it is the arrogance of a political elite caught in the Brussels bubble which holds sway. Instead of asking the peoples of Europe what they think or what they want in democratic referenda, the EU has chosen instead to spend billions of euro each year pumping out pro-EU propaganda. In 2008 alone, the EU spent a communications budget of 2.4 billion euro. The EU Commission complain about Press Freedom in Hungary while paying Agence Europe Press (AFP) 40million euro over 4 years to provide communication services on behalf of the EU. They say, the presses are free only for those who own the printing presses. So in the EU, instead of popular consultation and democracy, you get propaganda. I am all in favour of democratically elected national governments cooperating together, freely agreeing minimum standards if that is what they want. Cooperation and free-trade is great, but that is all we need. Political union however, cannot and will not work. The EU is asking the Finnish people to bail it out, when the EU accounts have not been approved for 15 years. Given that the EU is a codeword for profligate waste and fraud, the question to you is – Should you, the Finnish people, trust your money to this organisation? The EU, the institution of mafia fraud and fleets of Mercedes is the last institution the Finnish people should be entrusting their hard-earned money to. The best description I have heard of the EU is that it is a racket by which money is taken off those who do not work for the EU and given to those who do. And the unelected bureaucrats who work there wish to tax you and control you – as you pay their generous wages. Given the damage that the EU has done to your national democracy, we live in a time, not of despair but hope. The tide of events and public opinion is moving in our favour. The growth in social media such as Facebook and Youtube means ordinary people can exert power and even bypass the Establishment old media wedded to the EU project. Again and again in the UK, I see more and more young people coming to the cause. The poll ratings of the True Finns Party has been going up and up over the last three years to an incredible extent – the growth in popularity shows that your message is resonating with the people and gaining popular support. Some of the truth about the European Union has, I have no doubt dawned on Timo during his time in Brussels. He has seen and learned so much of how the EU operates- his views have been transformed. His views on the EU have become more pointed. He has seen in practice, that democracy in the EU does not work. 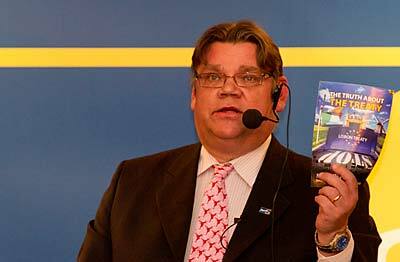 His experience is now a great asset to the people of Finland. People of Finland, your attendance at this meeting here tonight shows that you have an interest and love of your national democracy. May I encourage you in your path, in your struggle to restore Finnish democracy and assure you of a warm Eurosceptic welcome if you come to Britain.